Directions to get to the Winona Peach Festival and parking. Take the QEW Niagara bound, exit onto Fruitland Road (exit 83), travel south on Fruitland Road (the third set of traffic lights) until you reach Hwy 8. At Hwy 8 turn left and travel along Hwy 8 to just past Fifty Road. Puddicombe Estates will be on the right hand side. 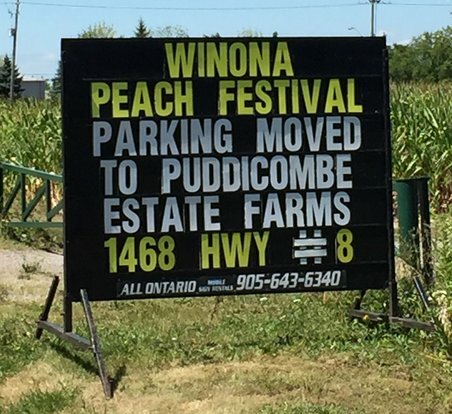 There will also be signs pointing you to Puddicombe Estates, 1468 Hwy 8, Winona, ON. Take the QEW Toronto bound, exit onto Casablanca Blvd (in Grimsby, exit 74), travel south on Casablanca Blvd until you reach Hwy 8. Turn right onto Hwy 8, watching the signs pointing you to our parking lot at Puddicombe Estates. Puddicombe Estates will be on your left hand side, just before Fifty Road. We do not recommend using the Fifty Road exit from the QEW, due to the high volume of traffic. 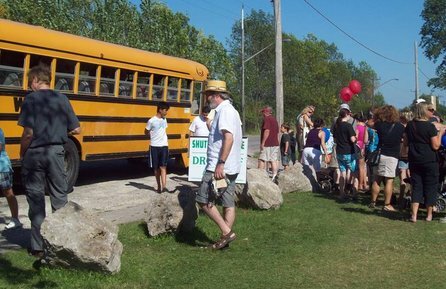 Hours of Bus Operation Click here to download the HSR schedule. HSR Express bus running from Eastgate Square to Winona Peach Festival does not stop anywhere to or from the Festival. 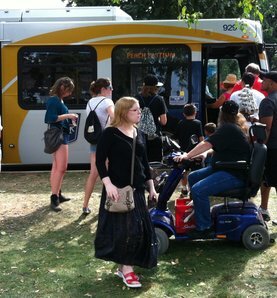 Buses will run every 12 minutes. 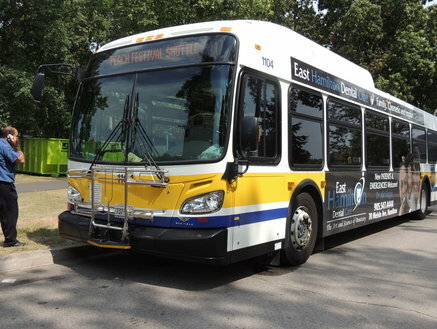 Please leave a Food Bank donation (in the bins located at Eastgate Square Route 58 Bus Stop) for the free ride. We also have our off-site parking lot, located at Puddicombe Estates. Parking is free and the cost of the bus ride is $5.00 each (round trip), Seniors $2.00 each (round trip) and children under 13 ride free. All proceeds go to running the Winona Peach Festival. Additional handicap parking, motorcycle and bicycle spaces will be provided at St. Gabrielle's school, on Barton Street across from Winona Park. Bicycles please bring your own lock. This parking will be on the west side of the school, the school's Parent Council will be using the east side. All parking at your own risk.